Macro Toolworks and Perfect Keyboard Forums - How to start Perfect Keyboard / Macro Toolworks automatically on Windows startup? How to start Perfect Keyboard / Macro Toolworks automatically on Windows startup? 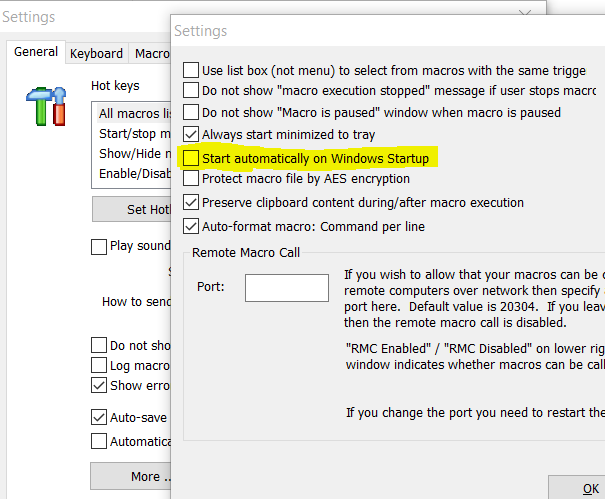 Q: How to start Perfect Keyboard / Macro Toolworks automatically on Windows startup? A: There is an option to do so in "Settings" window. Click on "More..." button and check the option as shown on this screenshot. Note: This option is not available in Free edition of the software.